﻿ Swami & Me - UNCEASING GRACE - Mrs. Kalpana V.
Mrs. Kalpana V. served as an A grade artist in the All India Radio as a newsreader and announcer for five years before moving to Mumbai in early eighties where she worked for the Film Division of India lending her voice for news-related programmes as well as several commercials. In early 1989 she received the Best Commentary Speaker award from the Ministry of Information and Broadcasting, Government of India. Later she spent 15 years in Hyderabad working for the Television and Film Division until 2005. Currently she lives in Bengaluru and volunteers for Radio Sai. It was April 27, 2011 – the most devastating day of our lives. In one instant we felt our existence now had little meaning. The void in our hearts was so deep and painful that taking every breadth was an ordeal. Why are we even living to see this day? “Oh Lord, why did you do this to us? Please have mercy...” we prayed and pleaded; we were shattered completely. Tears streamed down in a torrent as we witnessed the last rites being performed. Our lives had completely turned on its head. The only Constant through the ups and downs of our lives had left us so suddenly and shockingly. We felt so utterly orphaned; we turned numb. Carrying this Himalayan boulder of sorrow in our hearts, we – my daughter Smitha and I – started our journey back to Bengaluru. Smitha was driving. We weren't speaking much; the silence was hard and heart-rending. We could feel each other's sense of loss. There was a lot of agony and sorrow within and plenty of unanswered questions running inside continuously. It was extremely difficult. The last few days had been too traumatic. Even though our vehicle hit the van Smitha tried her best to steer right so that we could move on to the second lane of the highway. However the sheer impact of the sudden braking was so much that it sent our car skidding sideways. Within seconds, the car hit the central divider and the crash was so bad that the next moment we were in the air. Bumping off the concrete the automobile flew like a jet-plane, twirled and then dashed on the hard road with a huge thud. It was upside down. 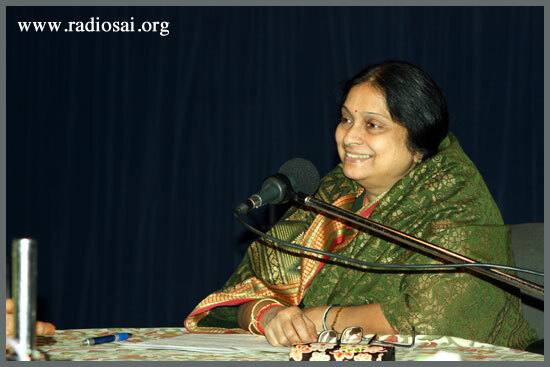 Mrs. Kalpana V. conducting a programme at the studios of Radio Sai, Prasanthi Nilayam. I was amazed to see that I was alive and conscious! My entire body capsized and head overturned, the only thing that remained same was my pathetic pleas - “Baba! Baba!” Now, they were louder than ever. I heard Smitha screaming at the top of her voice “Sai Ram! Sai Ram! Swami! Swami! Sairam!” Thank god, she was conscious too! Except crying out for Him, what else could we do? Who else do we have in this world? Surviving somehow in that completely mangled and inverted car, I noticed a few vehicles passing by and called out louder “Baba! Baba!” but none of them seemed to stop for us. However, soon an old Muslim gentleman and an elderly lady came to our rescue; positioning themselves on either side of the car they pulled the doors as hard as they could. After a lot of effort, their hands finally managed to reach us. But we were stuck with the seat belts. Smitha could somehow unlock her belt and given her slender figure could extricate herself out of that severely smashed mass of metal and steel. Fortunately with persistent and painstaking attempts I too could be wriggled out of that depressing rubble. And now when we watched the wretched state in which our car was with its windshield shattered into a million pieces and its body mangled beyond recognition, I just could not believe that two front seat passengers of this vehicle were not only alive to tell this tale but also were completely unscathed! How the two passengers in the front seat of this completely wrecked car live to tell us this tale shall always remain a symbol of Baba's grace. There was not a single scratch on our bodies. However both of us were shaken but my daughter was more disturbed than I; she was shaken mentally and crying inconsolably. Here again, something incredible happened. Just then three cars arrived and quickly stopped. One lady and five gentlemen alighted and immediately came to our rescue. The lady Mrs. Bhavna took my daughter to her car and comforted her while another person who was a doctor gave her pills and first aid to help overcome her shock. To our pleasant surprise, all of them were Sai devotees. In fact one among them was a former student of Bhagawan's university; he instantly shared some Vibhuti that Swami Himself had given him sometime back; in fact that was from the last occasion Baba had blessed him with Vibhuti packets. There was also this elderly gentleman Mr. Thakker who was on his way to Kodai Kanal to participate in a service activity. We did ask him to leave as he had little time left but very kindly he stayed with us till 8 in the night. Interestingly, every part of the front glass of the car except the area where we had placed stickers of Baba and Lord Ganesha was broken. But Bhagawan’s beneficence did not stop with that. I then called up a family friend for help. And for some really unexplained reason, he happened to be in Devanahalli at that point in time! Swami had taken care of even that! We finally managed to reach home by 10 p.m. while our damaged vehicle was towed by the car company who later called to say that our Maruti Zen was impossible to repair. The way Swami’ love touched our hearts through His devotees that day is simply unforgettable. We had started our journey crying that our beloved Lord had left us. But Bhagawan saw to it that we ended it shedding happy tears that He was very much with us! I can now with all conviction say that Swami is with all of us, all the time! He is beyond death and is always available to whoever calls upon Him for help. 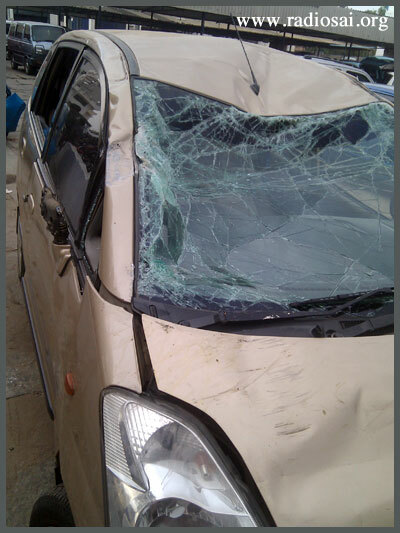 Our car was hopelessly smashed in the accident, but the incident rekindled our hope and faith in the Lord. We lost a car that day, but got reunited with the Divine Charioteer of our lives! In fact we did feel His protective presence even on April 25, 2011. After we had Baba's darshan that evening and came out of the Ganesh gate, the police did not allow us to take left where our hotel was. We had to turn right and go to the Chitravati road, which meant we had no option but to take a lengthy and circuitous way back to our room. But I was so exhausted mentally and physically that day that I said to Smitha, “I cannot walk any longer” and just sat on the road divider. In a few moments a huge police van came that way and fortunately they obliged to my daughter's request and dropped us at our hotel. Not only that, there were two DCPs (Deputy Commissioner of Police) in that vehicle and one of them was kind enough to give us his number and even told us to give him a call should we need any help in the near future. And indeed we had to fall back on this God-sent saviour on the morning of April 27. Given the massive crowd that day – it was almost as if the entire humanity had descended to witness the final journey of Bhagawan – there was no way we could enter the Sai Kulwant Hall even though we are not unfamiliar faces in Prasanthi Nilayam as I have been coming to Baba for the last forty years, and do know personally many distinguished elders of the Ashram. But when we dialed the number of this DCP that morning He did take our call. Not only that he personally escorted us into the Sai Kulwant Hall and left only after we had a decent place to sit! It was absolutely unbelievable. Earlier I used to narrate to Smitha every now and then various miracles of grace of Baba but on this occasion she felt it herself. “I have experienced a lot of economic and emotional debacles in my life, but I have never allowed any of these to come in the way of my love for my beloved Swami,” says Smitha, “and now He has given me a new life. I do not know how to express my gratitude to Him.